It's intended for pupils from basic schools (primary schools), high schools (middle schools), universities and children from organizations working with children. Organizers: SGP Systems, TIB (Czechia). TIB (Slovakia). Deadline: June 20, 15:00 - teacher enrolls school and students on the server, creates Contest groups and set up, when and how long will groups compete. The results are not public. Only the logged teachers from the school can see them. Student can be onlz enrolled by a teacher. 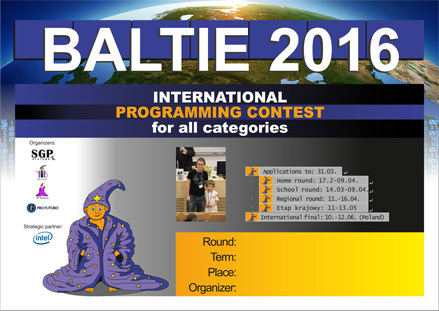 First the teacher logs in on the contest server (with the login to his/her SGP account), in the left menu he/she chooses contest Baltie - the lovest round, then click on the top folder menu the "Commisiion, Groups, Contestants, Protocols", set the contest time and verification code fot the group and and enrolls students. More tasks are solved, typically between 4 and 8. Home round: there are no limit, students can work at school or at home. Contest time is determined by school organizer for every contest group (folder "Commission,Groups,Contestants,Protocols"). Contest server does not allow (except home round) working from a different IP address than the public IP address of the Contest place (which is set by the organizer in the "Contest venues" forlder).